What are keys to being an effective speaker? I ask that question at workshops and you can see some of the responses. 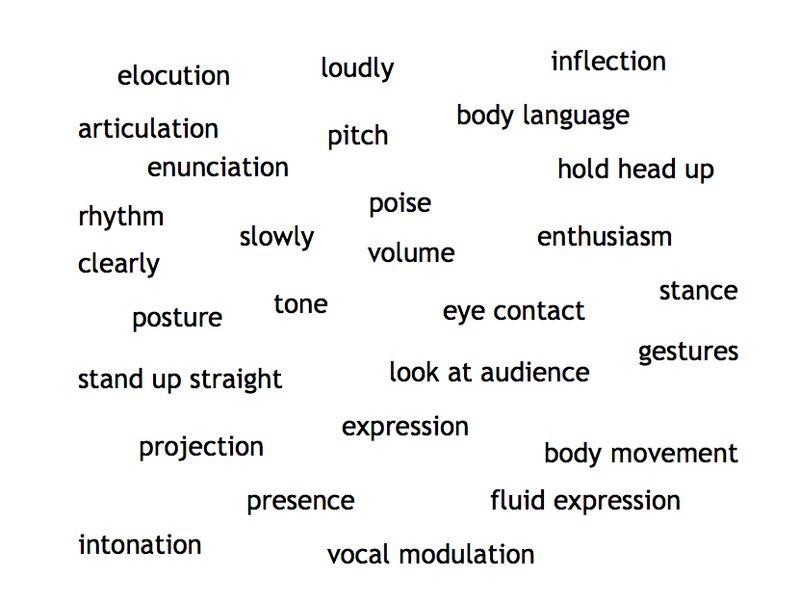 Some are confusing: Does “expression” mean facial or vocal? Some are wrong: “pitch” is important in choir and “rhythm” is important in the greeting card business. Some are bad advice: speaking “slowly” is a bad idea for an exciting story, speaking “loudly” suggests shouting and fails to realize that we can sometimes speak quietly for effect, and “enthusiasm” is inappropriate for many speeches (“Yesterday, my grandmother died!!”). The rubrics below give some idea of how haphazard our approach is. so teachers can know how to teach those skills. The logical, multiple-trait framework I introduce in Well Spoken will make teaching and evaluating speaking much easier. First, recognize that there are two very distinct parts of all effective oral communication: Building the Speech (all the things you do before you utter a word); and Performing the Speech (the skills needed as you are speaking the words). Never blend those two distinct features in a rubric. In the book, I show how a student built a speech against a Supreme Court decision. Click here to see an organizer with the opposite viewpoint. Click here to see a “building” rubric. Click here to see a “performance” rubric. Click here to see a rubric Laurie Whitmore of CA created for a great beginning-of-the-year assignment. Note that she doesn’t cover all of ACOVA or PVLEGS yet–yes, that is legal! Click here to see a historical fiction book report rubric. Click here to see a rubric for K-2 students. Click here to see a rubric for a high school science organelle project. 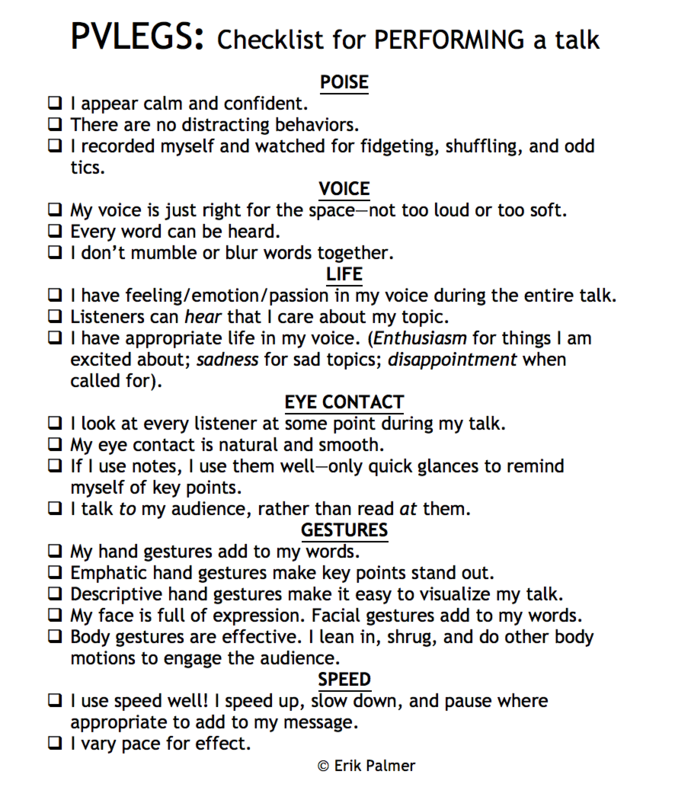 Click here to see a podcast rubric from Digitally Speaking. 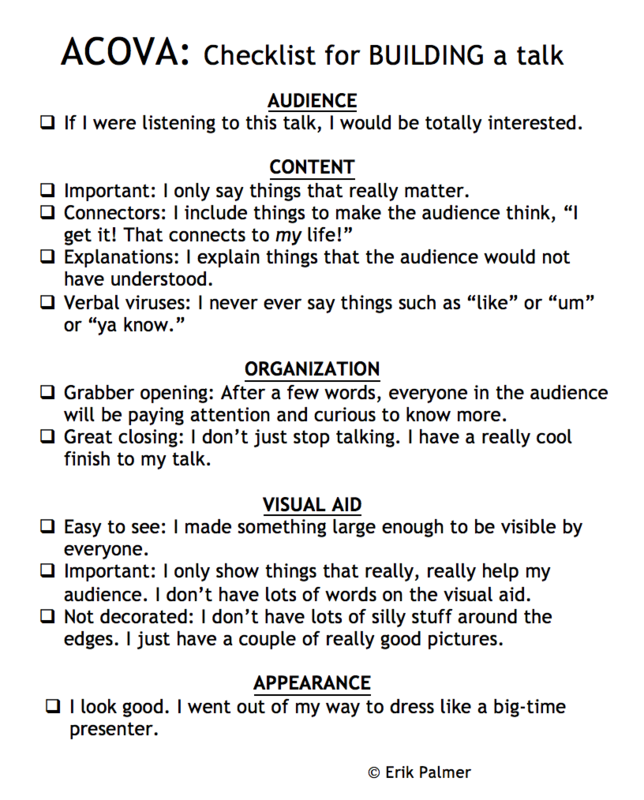 Click here to see a performance rubric for digital presentations. Click PVLEGS studentscoring to see a score sheet students should use as they listen.